Brooklyn Wort (summer 2011 edition) was last Saturday. Here’s a quick recap, which I’ll call the epilogue for 13 Weekends, since I’ve been talking about this damn thing all summer. Did you brew at Brooklyn Wort Summer 2011 and/or try my beer? 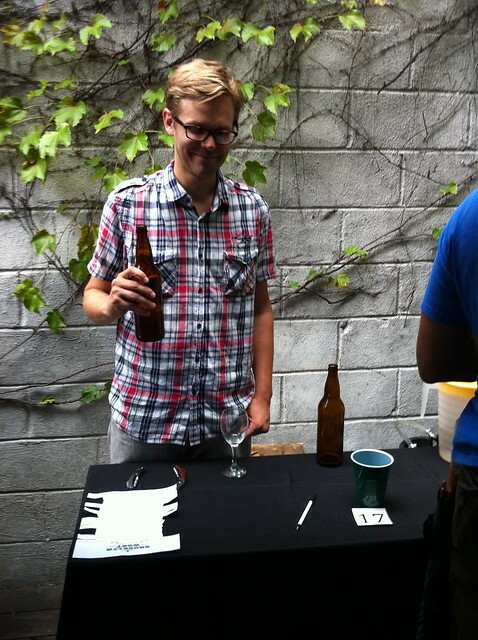 I’d love to stay in touch and talk beer—here I am on Twitter and Facebook or just leave a comment to say hey! I was a little nervous. We were running late getting to the brew shop to get the beer from the basement, the car was late, the traffic down to Sycamore was awful, and I’d never done this before. But we made it with plenty of time to get the beer on ice and chilled. We reviewed the sheet of competitors and joked that next to the beer style they should have listed each brewery’s square footage, to give a better sense of the degree of difficulty. There were two tastings, each lasting about 2½ or 3 hours (I kind of lost track of time). I was set up outside, in the shade in the back garden. This was probably the best spot to be, although it still got pretty hot. Maggie helped me serve during the first tasting. I tried to get her to accept some credit for the beer, but she kept denying any involvement. 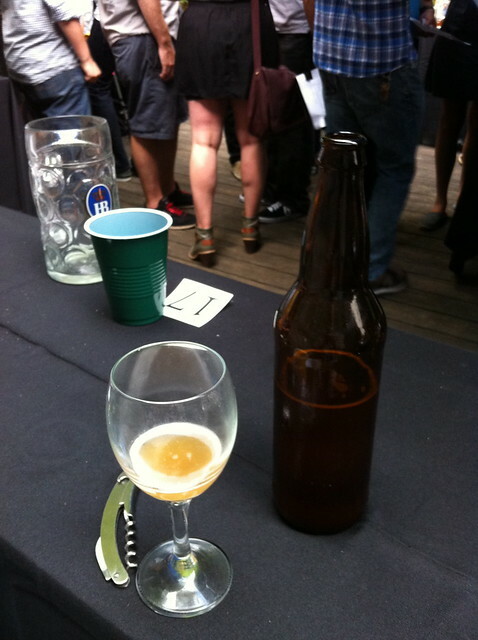 Incidentally, on the topic of women serving homebrew, there were exactly zero female homebrewers competing in the event. 25 dudes. However, I met a number of them throughout the day, so I know they exist. Hopefully this particular competition was just somehow, coincidentally all male. I got there not really knowing what I was going to say about my beer. By about the 4th pour, I had the stump speech down. Nearly everyone there was a super aficionado, so I didn’t really have to explain what a saison was, or what to taste for (but I did anyway). The fellow homebrewers gave themselves away by asking which specific strain of saison yeast I used. Maggie peeled off after the first session to trade off on child care duties with our friends Doug and Amanda, who had tickets to the evening session. As the evening went on, multiple people sought out my table saying they had “heard good things” from the front of the bar about my beer, which was just… whoa. As Michael Scott said, my heart was very full at that moment. The day was full of rewarding conversations, whether about my beer or someone else’s or homebrewing in general. My only regret was that, in all of the hubbub, I wasn’t able to taste everyone’s beer. I got to try half of them, maybe a few more. I was floored by the quality. Not a bad beer in the bunch. My two personal favorites were an impeccably balanced imperial brown and a 12% barleywine fermented with three different yeasts, one of them wild. Both won awards. I just tasted the first hydrometer sample from my malty, 8.5% winter warmer/biere de garde mashup that I plan to condition until Christmas and give as a gift. 1.014 after 11 days in the fermenter, with definite brown sugar and biscuit flavor, and a sharp alcohol aroma that will fade with time. No fair posting this at 8 in the morning. I’m with Tony, and it’s especially rude since I am still pregnant. That said, it sounds like your brew was a solid one and that there were just looking for something a little more unique. Keep up the good work and feel free to bring a little of that 8.5 back to IA for the holiday. Very nice! If you are struggling to find storage I could rustle up a few hundred square feet. Great post! There should totally be some kind of algorithm to factor in square footage when judging beer, lol. I knew it was a good omen that I was assigned to table 23 for my cat 23 American Strong. I really enjoyed your saisson – hope you were able to save a bottle or two bc it might be amazing with a little age. Def a well-made beer. Thanks Simon. I was able to save a couple of bottles and I’m really curious to see how it ages. I brewed a wet hopped (Chinook) American brown yesterday–it’s not imperial, but I hope it turns out as well as yours.